Vinea Electa by Salvador Dali, ca. 1967. 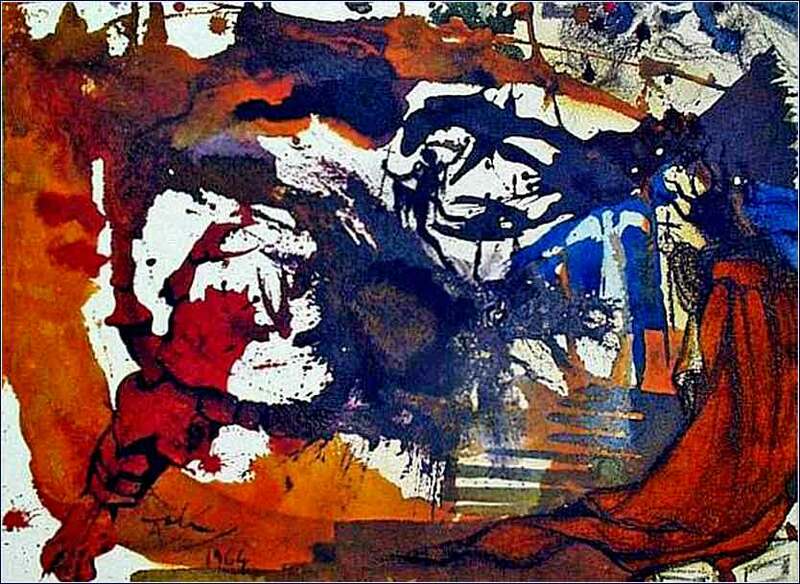 This mixed abstract expressionist/symbolist work captures the wrath of God expressed in Isaiah 5:6, where Israel is compared to a vineyard (vinea electa means “my chosen vineyard”) which God will destroy. A figure at the center is attacked by a dragon, perhaps a reference to Revelation. God in heaven, you have helped my life to grow like a tree. Now something has happened. Satan, like a bird, has carried in one twig of his own choosing after another. Before I knew it he had built a dwelling place and was living in it. Today, My Father, I am throwing out both the bird and the nest. 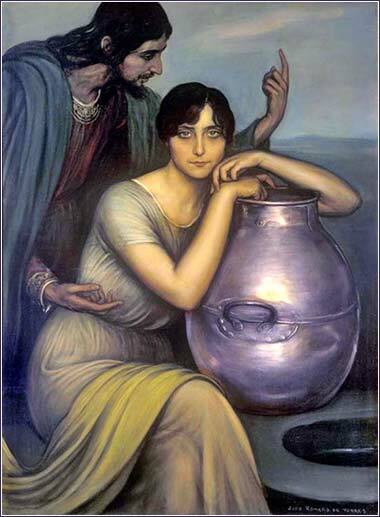 The Samaritan Woman by Julio Romero de Torres, ca. 1910. Jesus and the Samaritan woman (John 4), the first Gentile sinner to know Christ. In verses 19 and 20, we get two more abrupt, almost parenthetical statements that take some work to piece together. Compared to the trained rhetoric of the preceding chapters, Paul's writing here is almost clumsy. Each statement makes sense, but the style is aphoristic, like Proverbs, only without the poetic skill. We may be sure that these fit together in the minds of Paul and his listeners, but today’s readers (or translators) are challenged to understand how they connect. When Paul tells the Galatians it is always good to strive for good, he surely means to exclude the striving of the Judaizers to pull the church away from grace through faith and return it to the “slavery” of the Law. But he also means to exhort the Galatians to be zealous for Christ; and he wants their zeal to come from their own spirit and faith, not depending on Paul. For if they wander off from the Gospel when he is away from them, they have not truly accepted it. ne must think, here, of the Sunday Christian. None of us escape it entirely. We feel more religious when we are in church than when we are at a rock concert or fighting traffic. How do we solve this? One approach is to withdraw from the secular world, either totally or in large part. It is a strategy used by many of the most devoted Christians, now and throughout history. If going to a secular concert takes you farther from the Spirit, one strategy is to skip the concert. Many devout Christians will not go to non-Christian movies and or associate non-believers — except in the course of bringing the Gospel to them. Use of this stratagem does have Biblical authority. Paul tells us, for example, not to “yoke” ourselves together with nonbelievers. There are varying degrees of Christian isolationism: Cloistered monks and nuns at the extreme, then separated communities like the Amish and Mennonites; and then people who live in secular surroundings but home-school their children, or send them to explicitly Christian schools, and center their social life on their church. But we must also remember that Christ sent his disciples into the world to spread the Word. (e.g. Luke 10:1-20; Matthew 10) The famous admonition to them, “I am sending you out as sheep in the midst of wolves, so be wise as serpents and innocent as doves.” (Matthew 10:16) Most of us choose to live in the world, to a greater or lesser degree. In our circumstances, our relationship to Christ is much the same as the Galatians’ relationship to Paul. So Christ, and now Paul, suffer a fate similar to that of Eve: to give birth to forgiveness, they must suffer as she suffered to give birth to children, and for the same reason. We must suffer for God's grace, not because God's grace has anything to do with suffering, but because our sin has built a barrier that is painful to breach. Romans 8:6 (ESV): The mind of the flesh is death, but the mind of the Spirit is life and peace.